Invisalign is an orthodontic treatment that works the same way braces do, but they are practically invisible. The treatment is simple and will have your smile and confidence back to 100%! The aligners are made by using 3D computer imaging technology. Each aligner builds on the previous one to make sure your teeth are corrected gradually. This process ensures an optimal alignment for your teeth. The aligners are discreet and hardly noticeable when they are applied. This makes them extremely desirable compared to the traditional wire braces. You also don’t need to adjust your diet or avoid certain foods, because invisible braces can be easily removed during meals. Since the aligners are removable you can easily brush and floss without any hesitation! Most Invisalign patients say the aligners are much more comfortable than regular braces, as well. They don’t mess with the soft tissues of the mouth and cause soreness. Also, no routine adjustments are needed, which means the treatment is quick and seamless! 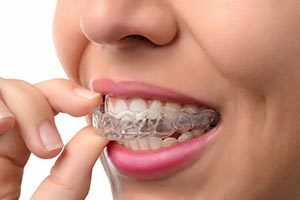 A series of aligners will be made which will gradually carry your teeth into the desired position. Each set of aligners is worn for around two weeks before wearing the next in the series. This process is going to make sure your teeth are moving in the correct position and the dentist can make sure everything is working as expected. The aligners should be worn throughout the day but should be removed while drinking, eating, flossing, and brushing. Invisalign patients need to visit the office every 6 weeks to assess the the procedure and most of the treatments get completed within 15 months. If you’re a Trinity resident, Invisalign treatment is within your reach. You visit the Invisalign website for more information or call our office for a free consultation!